I used to think that attributes were the cat’s meow. After using them extensively, I discovered that they are just another layer of obfuscation that complicates the maintenance of the code. I realized that a much better implementation would have been to keep the the imperative code separate from the metadata declarative portions. As it stands, the source code combines both. What I think would be better is a separate, purely declarative, repository as a map of the imperative code and the desired attributes. This would have allowed the attributes to vary independently from the code. Consider changing a serialization attribute, like the XML attribute name, or a description of a property to assist the form designer. Good grief, I have to touch the code base to do that? So that’s what I’ve learned over the years, is that the code and the attributes should actually have been kept physically separate. Why do we fear the unknown? It is unknown, not knowable, it can bring struggles or it can bring great joy. It seems that we fear what is known because we want to maintain control over something, or we want to ensure that it continues or stays the same. But fearing the unknown? That makes no sense. Be open to the experience of the unknown without expectations so nothing is missed. We help effective nonprofit organizations receive sustainable, multi-year funding, so they can focus on what they do best: providing services to citizens. We work with government agencies to help them sponsor innovative and preventative programs without the fear that taxpayer dollars will be wasted on ineffective programs. And by focusing on preventative programs, we help governments mitigate spending on crisis intervention over the long term. We raise funds from investors and foundations seeking both social and financial returns. If the funded programs achieve a measureable impact, our government partners repay the investors who provided up-front capital and assumed the investment risk. If measured outcomes do not improve, the government pays nothing and the investors’ capital effectively becomes a donation. Nonprofit organizations go into the Cultural Realm. This is debatable but it makes a certain sense to me that, in the cultural realm, groups of individuals can form loose organizations whose intent is to participate together in a “cultural” activity. A nonprofit organization is a necessary cultural entity (in my opinion) as an interface to the economic (for-profit businesses) and rights (government) realms. Government agencies are of put into the rights realm, again this isn’t ideal. 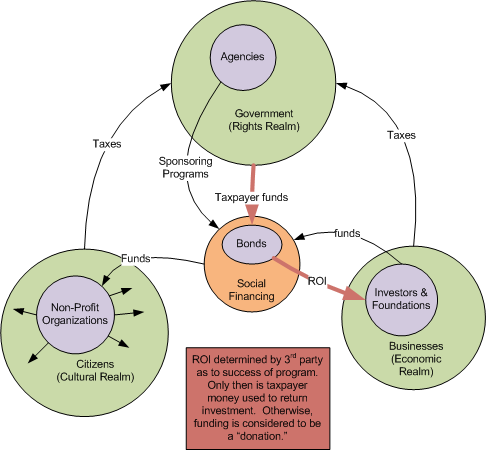 However, in this Social Finance model, the government is participating in the economic realm via taxpayer money and also has its fingers in the cultural realm in deciding what programs to sponsor. I put “investors and foundations” into the economic realm. Again, this is debatable, but my reasoning is that investors and foundations participate mostly in the economic realm and are separated usually from the direct, local, community needs. The investor, not the taxpayer, assumes the risk. First, the investor of, say, a social project will not see an ROI on their investment because the result probably doesn’t have a monetary value that can be linked to the initial investment in some clearly defined way. For example, funding trainers in Non-Violent Communication to provide workshops might be considered a worthwhile social project but has no measurable monetary return. Second, large scale projects (let’s say a “village” providing training, child care, health care, small business opportunities, etc.) is not something a low income area can fund directly nor can it return the investment, with interest, on such a project—how would you go about “taxing” the “income” generated, and over what time frame? Government in this case, and in its present form, provides a valuable service of collecting taxes from a far wider pool of people which can then be distributed to specific areas of need. This model (and for this reason I placed the RSFSF outside of the cultural realm) is also intended to be an intermediary between the economic and cultural realms. Unlike the SFUS described earlier, there is no government involvement in the flow of funds. 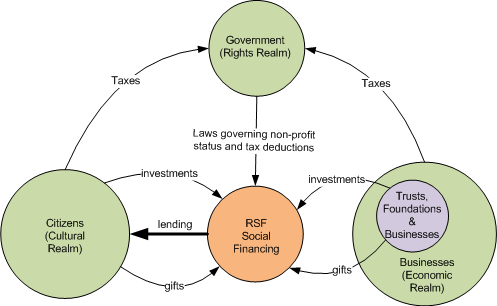 Similar to the SFUS, the RSFSF has the ability to pool funds, enabling it to fund large scale projects. Unlike the SFUS, this pool does not come from taxpayer money (which has more of an anonymous quality to it) but rather the investments of citizens, communities, trusts, foundations, businesses, etc. Like the SFUS, I see the RSFSF attempting to work within the confines of the existing economic architecture. There aren’t any particular conclusions to draw here in this cursory overview of these two models. Both are attempts to meet the needs of both investors and social renewal projects, and within the framework of the current economic system, personally I think both models express some creative thinking, which we need more of, if I were to make any conclusion at all. 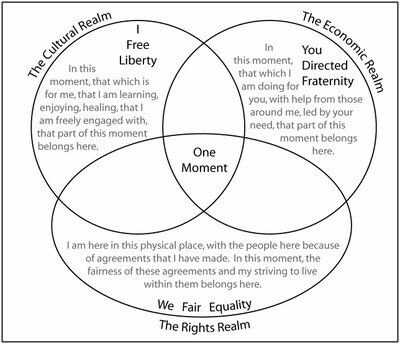 From the perspective of Steiner’s Threefold Social Renewal, the RSF model is closer to that vision, but in my mind, that doesn’t, in itself, make it a superior model–though that would be my personal bias. I am curious though, what do readers think?